Mayom County, located in northwest Unity State, experienced a sharp decline in food security in late 2017 and early 2018. 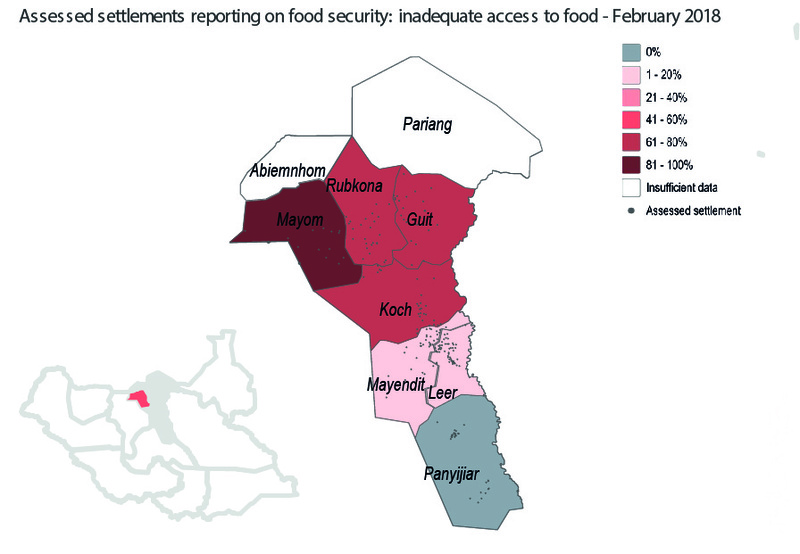 By January, the Integrated Food Security Phase Classification (IPC) report projected that even with humanitarian aid, Mayom would likely reach Phase 3 on the IPC scale − a crisis in food insecurity. If humanitarian assistance was not to be provided, the status was expected to deteriorate to emergency levels. The alarming developments were noted to be compounded by the longstanding challenges residents of Mayom face in regard to access to basic services, including water, education and healthcare. In order to gather information on the recent developments and to support humanitarian actors working to address the severe situation in the county, REACH conducted a multi-sector needs assessment mapping the humanitarian conditions in Mayom. Data was collected through remote interviews with 78 key informants in 62 settlements and four focus group discussions in the protection of civilians site in Bentiu Town. According to the findings by REACH, conflict, unreliable rainfall and market shocks were reported as the main factors hampering access to food. Yet, when it came to the impact of the named factors, the lack of rain rose above others, and drought had reportedly led to the reduction of crop yields in almost 70 percent of the assessed settlements. The lack of rainfall had also limited coping strategies like fishing and foraging for wild foods adding a further strain on the residents of the county. Overall, access to food had declined from 86 percent in September 2017 to only 6 percent in February 2018 − a development which cannot be explained by seasonal variation alone. The assessment noted that food security was only one in many of the alarming conditions seen in Mayom county, with ongoing challenges reported in access to basic services, including safe drinking water, healthcare and education. During the time of data collection, only half of the assessed settlements reported access to safe drinking water through boreholes or tap stands and another half was noted to depend on hand dug wells and surface water, often shared with livestock. The education sector was reported to operate with limited capacity characterised by a lack of infrastructure further constrained by the inaccessibility to schools during rainy season. Overall, only one-third of the assessed settlements reported children going to schools. In the light of the recent findings, it is clear that increased humanitarian assistance will be required to both address immediate gaps in humanitarian needs and reverse the concerning trends in Mayom County. For a more comprehensive overview of findings from the assessment, visit South Sudan’s page on the REACH Resource Centre and read the full Mayom County Population, Food Security and Livelihoods and Services Profile, December 2017 – February 2018.